We are passionate about our community and want to support our local schools and youth programs in the area. 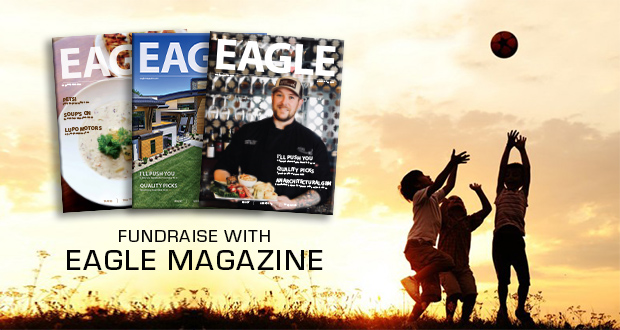 We give 100% of the profit from every one-year subscription of Eagle Magazine purchased with your schools ”promo code” right back to you. Not only is this a great way for your school or sports team to raise money but it is virtually effortless! Our online subscription platform maximizes efficiency and increases your reach for fundraising without the hassle for your PTA, staff or volunteers. We even create a custom incentive program with a local business for the class with the highest participation that is sure to get students and teachers excited to get involved! Contact us today to get your fundraiser started! We will provide you with you with a newsletter to be sent home with each student, a digital campaign that will be easy to share on your website, via email, and across social media platforms. Our online platform makes it easy for students with their parents to share with friends and family online with a no-hassle, pressure-free approach to fundraising!